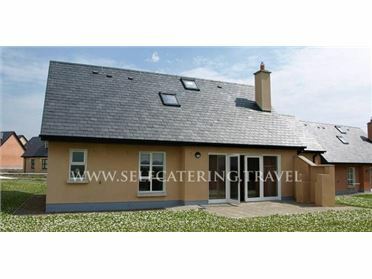 The Store is a heart-warming cottage located by the village of Shillelagh, County Wicklow. Hosting one mezzanine double bedroom, and a ground floor shower room, this property can sleep up to two people. Inside you will also find a kitchen, lounge/diner, and a conservatory. To the outside is off-road parking, and a gravel area with a patio and furniture. Guests also have access to a shared games room, a playground with slide and swings, as well as barbecue facilities and six acres of garden. Resting in a wonderful setting with an abundance of charm, The Store is a fabulous cottage in a much desired part of Ireland. For walkers, the Wicklow Way runs past the village, and the nearby Tomnafinnoge Oak Wood, one of the largest remaining oak woods in Ireland, makes a lovely spot for an autumn stroll. Coolattin Golf Club is just outside the village, while slightly further afield, discover the Wicklow Mountains, city of Dublin, and 'Ballykissangel' village of Avoca. Oil central heating. Electric oven and hob, microwave, fridge, TV with with multi-channels & radio, WiFi, selection of books, games and DVDs. Fuel and power inc. in rent over summer. Bed linen and towels inc. in rent. Cot and highchair. Off-road parking. Gravel and patio area with furniture. BBQ. 6 acres of garden. One well-behaved pet welcome. Sorry, no smoking. Shop and pub 1.4 miles. Note: Laundry room with washing machine and tumble dryer. Note: Guests have access to a shared games room and a playground with slide and swings. Note: Property has an additional fuel charge between November - February, this is payable to the owner.